From his first year in the majors, George Herman "e;Babe"e; Ruth knew he could profit from celebrity. Babe Ruth Cigars in 1915 marked his first attempt to cash in. Traded to the Yankees in 1920, he soon signed with Christy Walsh, baseball's first publicity agent. Walsh realized that stories of great deeds in sports were a commodity, and in 1921 sold Ruth's ghostwritten byline to a new… spaper syndicate for $15,000 ($187,000 today). Ruth hit home runs while Walsh's writers made him a hero, crafting his public image as a lovable scalawag. Were the stories true? It didn't matter-they sold. Many survive but have never been scrutinized until now. Drawing on primary sources, this book examines the stories, separating exaggerated facts from clear falsehoods. 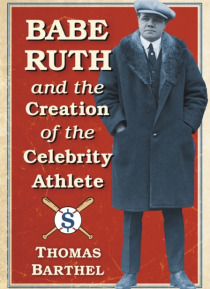 This book traces Ruth's ascendance as the first great media-created superstar and celebrity product endorser.